First published by Bloomsbury in the UK in 1997, Harry Potter and the Philosopher's Stone set off a literary epic that would envelop and change children's literature for the 21st Century. The first book of a seven-book series, Harry Potter and the Philosopher's Stone quickly captured the imagination and admiration of children and adults alike, and would go on to win countless awards in literature. Harry Potter and the Philosopher's Stone has been translated into over seventy languages, including Latin and Greek. It, along with the other six books in the series, has been cinematically adapted as well. The true first edition is considered the 1997 UK Bloomsbury edition, and copies are extremely scarce. Only about 500 hardcover copies were printed in the first run, so those are typically the most valuable of the original 5,000 copy run. There are several points for true first editions. First, the word Bloomsbury is included in the title page. Second, the copyright date is 1997. Third, the copyright page will include the full number line. And finally, there is a misprint on page 53, which lists "1 wand" twice in the school supplies list. There are countless different editions of Harry Potter and the Philosopher's Stone, but there are a few notable collectible editions. 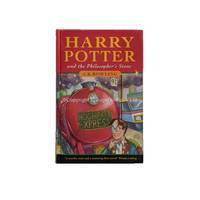 The first US edition was published by Scholastic in 1998 under the revised title Harry Potter and the Sorcerer's Stone, with small changes Americanizing some of the language. An illustrated version of Harry Potter and the Philosopher's Stone was published in 2015 by Arthur A. Levine Books, and it was illustrated by Jim Kay. The sequels include Harry Potter and the Chamber of Secrets, Harry Potter and the Prisoner of Azkaban, Harry Potter and the Goblet of Fire, Harry Potter and the Order of the Phoenix, Harry Potter and Half-Blood Prince, and Harry Potter and the Deathly Hallows. UK: Bloomsbury, 1997. 1st Edition 1st Printing. Hardcover. Fine. Harry Potter and the Philosopher's Stone by J.K. Rowling First Edition First Printing Bloomsbury 1997. Very faint eraser mark to where a child's name was written on the half title page. Imperceptible ghosting on copyright page where a corresponding sticker was removed. Otherwise unmarked and unblemished throughout with the page block and binding still very much square and tight. The original publisher's boards have been painstakingly and skilfully restored to their bold and vibrant original condition. This was carried out with incredible precision by Richard Reeve, the leading restoration and paper conservator. The book now presents as a bright and fine copy. One of only 500 copies to be published. This is a most beautiful UK first edition of the original hardback from Bloomsbury. It is a very desirable early printing of the first book, with the series 20 19 18 17 16 15 14 13 on the copyright page. The rear wrapper has the very early picture of Dumbledore as a young man. The publisher page credits Joanne Rowling, but does not have the original erratum, a missing space between "r" and "1" on Thomas Taylor (illustrator). Book and dust jacket are in pristine condition. Very fine. UK: Bloomsbury, 1997. [Edinburgh:] in association with The Scottish Braille Press,, 1998. 5 volumes, folio. Original purple paper wrappers, wire-stitched, titles printed in black to white paper label to front covers, titles printed in braille to clear acetate label to front covers. Centre leaf of each volume a little creased at fore edge, else a fine set. First Braille edition, signed by the author on the front cover of each volume, with the authentication hologram to inside front cover of each. The signing and sale of this set was in aid of the Royal Blind, the Edinburgh based charity which runs The Scottish Braille Press. Rowling visited the Press in 1997, and saying that she was "honoured that the title had been chosen" when publication was announced (Thomas, p. 5). In 2000 unveiled a new library at the Royal Blind School. This is believed to be the sole signed set of any Braille edition. Bloombury, London, 1997 First Edition, fourth printing SIGNED by J.K. Rowling on a letter laid into the book. A magnificent copy. This scarce Bloomsbury hardback has the early points with the lack of Hogwart's crest on title page and half-title. The ORIGINAL dustjacket is vibrant in color with minor wear to the edges. This copy is additionally accompanied by a very rare Harry Potter and the Philosopher's Stone postcard signed by the author. It is most likely the very earliest postcard design Bloomsbury issued and perfectly complements this exceptionally SIGNED book. The book is in excellent condition. The binding is tight with NO cocking or leaning. The boards are crisp with light wear to the edges. The pages are exceptionally clean with NO writing, marks or bookplates in the book. Overall, a beautiful copy SIGNED by the author. We buy Rowling First Editions.. Signed by Author(s). 1st Edition. Hardcover. Fine/Fine. London: Bloomsbury,, 1997 & 1998. 2 volumes, octavo. Philosopher's Stone in original pictorial wrappers, Smarties sticker to front cover, issued without a dust jacket. Chamber of Secrets in original pictorial boards, with the dust jacket. Philosopher's Stone slightly faded at spine, covers slightly creased, light creasing to top corners of some pages; a very good copy. Chamber of Secrets lightly bumped at spine ends, small mark to fore edge, a couple of marks to front free endpaper and half-title; an excellent copy in the dust jacket, lightly faded at spine panels with very slight creasing at spine panel ends. First edition, first impression of the Chamber of Secrets, first edition, eleventh impression of Philosopher's Stone, both inscribed by the author for Iain Dallas at a signing when he was a nine-year old-boy. He had written various spellings of his name in pencil on the title page of Philosopher's Stone: "Iain / Eoin Dallas / Ian Dallas / Ean Dallas". Rowling, upon seeing this, inscribed the title page of Philosopher's Stone "To Iain (not Eoin / Ian or Ean) with best wishes J. K. Rowling". Continuing the theme, she then inscribed the copy of Chamber of Secrets on the front free endpaper, "To Iain (how about Eeyan?) J. K. Rowling". A charmingly inscribed set of books, showing Rowling clearly enjoying interacting with her young fans, at a time when her fame was rapidly growing. Bloombury, London, 1997 First Edition, later printing SIGNED by the author on laid in signature. A wonderful copy. The ORIGINAL dustjacket is rich in color with NO fading. The rear wrapper has the very early picture of Dumbledore as a young man. The book is in excellent condition. The publisher page credits Joanne Rowling and contains no space between r and 1 on Thomas Taylor 1997 in error. The binding is tight and the boards are crisp with minor wear to the edges. The pages are clean with NO marks or bookplates in the book. A sharp copy SIGNED by J.K. Rowling.. Signed by Author(s). Hardcover. Fine/Near Fine. Near fine 18th printing as stated on copyright page, number list ends in 18. Inscribed by J.K. Rowling on half-title: "To Hayley, J.K. Rowling." Very, very light edgewear. London: Bloomsbury. 1997. First Edition; Third Printing. Hardcover. 0747532699 . This is the very scarce third printing hardback edition.. The rear wrapper has the very early picture of Dumbledore as a young man. The publisher page credits Joanne Rowling and contains no space between r and 1 on Thomas Taylor1997 in error. "First printed in Great Britain in 1997" stated on the copyright page, THIRD PRINTING (with number line 10 9 8 7 6 5 4 3). Hardcover with Dust Jacket (the 3rd printing was the earliest printing issued with a dust jacket- 1st and 2nd printing did not have dust jackets). The dust jacket is NOT price clipped and has a stated price of 10.99 British pounds. Some edge wear and toning to pages. Very Good in a Very Good dust jacket. Scarce. ; 223 pages; Original dust jacket protected by archival Brodart cover. All domestic orders shipped protected in a Box. .
First edition, third impression (Bloomsbury Publishing, Plc, 1997). The first and second impressions were issued without dust jackets, making this the first to have one. Original pictorial boards with a small ding to top edge of lower board, fine otherwise. The original and unclipped dust jacket has some fading to spine panel - as is common - and mild edge wear; fairly inconspicuous damp stain to top of dust jacket verso. Overall a very good copy indeed or better. Bloomsbury, London, 1999 First Edition, with the number line beginning with 1. This is the First Edition, First Printing of this deluxe edition. A spectacular copy. The book is bound in the publisher's original red cloth and appears UNREAD. The binding is tight with NO cocking or leaning and the boards are crisp. The pages are clean with NO writing, marks or bookplates in the book. A superb copy.. 1st Edition. Hardcover. Fine. Bloomsbury Publishing, 1997 A fine copy in a fine dust jacket. First issue of the Australian Edition. Full number line on the copyright page 10 9 8 7 6 5 4 3 2 1. Book seller's stickers affixed to the back panel of the dust jacket.. 1st Edition. Hardcover. Fine/Fine. The first Australian edition, fine in a fine dust jacket. Complete row of numbers from 10 to 1 on the copyright page. Housed in a custom-made collector's slipcase. First Australian edition, with complete row of numbers to 1 on the copyright page. Fine in a fine dust jacket. Housed in a custom-made collector's slipcase. BLOOMSBURY CHILDREN', 2004-01-01. Hardcover. Used:Good. London: Bloomsbury. London, Bloomsbury, 1999. First Thus. Hardback. A near fine copy. Slight pushing to the spine tips and corners. Overall, a nice copy of the first in the series. [7431, Hyraxia Books]. . Near Fine. Hardback. 1st Thus Edition. 1999. Australia: Bloomsbury Pub Ltd. 1997. First Edition; Second Printing. Hardcover. 0747532699 . Very Good in a Very dust jacket. 1st Australia edition 2nd printing. Jacket is not price clipped and displays 10.99 Lean to spine, owner inscription. ; 8.0 X 5.2 X 1.1 inches; 224 pages; Original dust jacket protected by archival Brodart cover. All domestic orders shipped protected in a Box. .
2004-01-07. New. Ships with Tracking Number! INTERNATIONAL WORLDWIDE Shipping available. Buy with confidence, excellent customer service! London: Bloomsbury 1997-2007, 1997. Book. Fine. Hardcover. 1st Edition. Octavo, original pictorial cloths and dust jackets, editions: 24th, 25th, 24th, 11th, and three first editions. Complete set of Harry Potter's adventure, as a young wizard in Hogwart and in the world full of the Muggles. 'The Harry Potter stories will join that small group of children's books which are read and re-read into adulthood. I imagine that the number of readers waiting patiently for the next instalment grows by the day.' the TLS. In mint condition, only spines slightly sunned..
London, United Kingdom: Bloomsbury, 2015. Book. Illus. by Jim Kay. Near Fine. Hardcover. First Edition/First Printing. 4to - over 9¾ - 12" tall. A square solid tight clean carefully read copy. Illustrated end papers and a sewn in silk marker. Pretty nice copy although not perfect. This copy has three light corner bumps else fine. The priced jacket has some lightish edge wear, a short tear near the heel of the spine. Prepare to be spellbound by Jim Kay's dazzling depiction of the wizarding world and much loved characters in this full-colour illustrated hardback edition of the nation's favourite children's book - Harry Potter and the Philosopher's Stone. Brimming with rich detail and humour that perfectly complements J. K. Rowling's timeless classic, Jim Kay's glorious illustrations will captivate fans and new readers alike. THIS COPY IS IN MY POSSESSION AND WILL NORMALLY SHIP NEXT DAY..
Bloomsbury Publishing PLC, 2004-10-04. Hardcover. Used:Good. Bhopal: Manjul Publishing House Pvt. Ltd, 2003. Book. Very Good +. Trade Paperback. Signed by Author(s). First Edition/First Printing. A square solid tight carefully read copy. This copy has some light cover rubbing wear, some browning to the edges of the text block, some light soil to the edges of the text block. French wraps. THIS COPY IS IN MY POSSESSION AND NORMALLY SHIPS NEXT DAY. First Hindi Edition stated on the CP page with no later editions noted. This Copy has been signed by J K Rowling on the half-title page. The publisher has added a hologram to the lower left hand corner of the front cover, not the Rowling hologram..
Bloomsbury,, . 8vo., Seventeenth Impression; pictorial boards, a fine copy in unclipped dustwrapper. Crisp copy of the the one that started it all, published in the same year as the first edition. Dustwrapper artwork by Cliff Wright. Bloomsbury Publishing. First edition-15th printing. Hardcover. Good/No Dj cover. GC plus.Bloomsbury Publishing,1997.First edition-15th printing(20 19 18 17 16 15).Joanne Rowling is displayed on copyright page.Pictorial hardback(two small nicks and scratch on the edges of the cover and spine) in GC plus, no DJ cover with the book.Nice and clean pages with small ink marks and slightly tainted on the outer edges,a couple of small creases and ink mark on the edges of the pages.Winner of the 1997 Smarties Gold Award displayed on the edge of the front cover.223pp.A collectable book but without the Dj cover. This is another paragraph Book Description: Harry Potter is an ordinary boy who lives in a cupboard under the stairs at his Aunt Petunia and Uncle Vernon's house, which he thinks is normal for someone like him who's parents have been killed in a 'car crash'. He is bullied by them and his fat, spoilt cousin Dudley, and lives a very unremarkable life with only the odd hiccup (like his hair growing back overnight!) to cause him much to think about. That is until an owl turns up with a letter addressed to Harry and all hell breaks loose! He is literally rescued by a world where nothing is as it seems and magic lessons are the order of the day. Read and find out how Harry discovers his true heritage at Hogwarts School of Wizardry and Witchcraft, the reason behind his parents mysterious death, who is out to kill him, and how he uncovers the most amazing secret of all time, the fabled Philosopher's Stone! All this and muggles too. Now, what are they? This is Jo's first book and she has already written seven outlines for Harry's further adventures at Hogwarts. Bloomsbury Publishing. First edition-18th printing. Hardcover. Very good/Very good. VGC.Bloomsbury Publishing,1997.First edition-18th printing(20 19 18).Joanne Rowling is displayed on copyright page.Pictorial hardback with Dj(very small tear, a couple of small creases and nicks on the edges of the Dj cover),both in VGC.Nice and clean pages with small ink marks and slightly yellow on the outer edges,previous owner's name written inside the edges of the front cover,pencil mark impression on the edges of the first blank page of the book.The book is in VGC with light shelf wear.Winner of the 1997 Smarties Gold Award displayed on the edge of the front cover and Dj cover.223pp.Price un-clipped.A collectable book. This is another paragraph Description: Harry Potter is an ordinary boy who lives in a cupboard under the stairs at his Aunt Petunia and Uncle Vernon's house, which he thinks is normal for someone like him who's parents have been killed in a 'car crash'. He is bullied by them and his fat, spoilt cousin Dudley, and lives a very unremarkable life with only the odd hiccup (like his hair growing back overnight!) to cause him much to think about. That is until an owl turns up with a letter addressed to Harry and all hell breaks loose! He is literally rescued by a world where nothing is as it seems and magic lessons are the order of the day. Read and find out how Harry discovers his true heritage at Hogwarts School of Wizardry and Witchcraft, the reason behind his parents mysterious death, who is out to kill him, and how he uncovers the most amazing secret of all time, the fabled Philosopher's Stone! All this and muggles too. Now, what are they? This is Jo's first book and she has already written seven outlines for Harry's further adventures at Hogwarts. England: Bloomsbury Publishing PLC, 2004. Book. Very Good. Hardcover. 1st Edition. This is the 1st printing 1st edition of the UK Adult edition. There is a little age toning to the top of the compressed page edges and a little bumping to the bottom of the spine. The jacket is unclipped. Vancouver, British Columbia: Vancouver, BC: Raincoast / Bloomsbury, 1997, 1st Canadian Edition, Later Printing ( 4th / Fourth ) , 1997. -------------hardcover, about 5.25w x 8h inches, a Fine copy, ---in a Fine dustjacket, a bit of age toning to paper, looks close to new, no writing in the book, this early edition contains two errors: Line 1, page 8 has "highchair" instead of "high chair"; and on page 53 in the list of "Other Equipment" needed for Hogwart's School, " 1 wand " is listed twice ---errors that were corrected in later printings, the upper portion of the spine and jacket and the rear panel show the young magician ( Dumbledore ? ), copyright page states Joanne not "J.K.Rowling", ---this early edition shows Bloomsbury on the title and copyright page BUT has Raincoast only on the lower spine tip of the jacket and the book , as well this has a Bloomsbury ISBN on the rear panel of the jacket, the book and the copyright page, this early edition (4th printing) lists Chamber of Secrets only as other books by JKR ( the 7th printings and onwards list more titles ), --- an early CDN issue with the Bloomsbury ISBN ---this is the earliest CDN issue that we have had, any image directly beside this listing is the actual book and not a generic photo ///NOT SIGNED ---GUARANTEED to be AVAILABLE/// . Later Printing of the first Edition. Hard Cover. Fine (see description)/Fine (see description). Illus. by Thomas Taylor Cover Art. Flap Not Clipped. London, United Kingdom: Bloomsbury, 2004. Book. As New. Hardcover. 1st Edition. First UK Edition Thus, First Printing. This is a true first edition, first printing (first impression) of the Adult edition with the number "1" and a full numberline to the copyright page to indicate a true first print. Uncommon. A Collectors Copy. Bloomsbury Publishing PLC (2010) - very good condition. Bloomsbury. First UK edition-6th printing. Hardcover. Near fine/No Dj cover as issued. Near fine condition.Bloomsbury,1999.First UK edition-6th printing(10 9 8 7 6) of this Deluxe edition.Printed in UK by Clays.Pictorial red hardback(gilt lettering and illustration on the front cover,gilt lettering to the spine, two small dents on the edges of the cover) in near fine condition, no Dj as issued.Gilted outer edges of the pages.Nice and clean pages as new with two small creases and light shelf wear on the edges of the pages.223pp.A collectable book. This is another paragraph Book Description: Harry Potter is an ordinary boy who lives in a cupboard under the stairs at his Aunt Petunia and Uncle Vernon's house, which he thinks is normal for someone like him who's parents have been killed in a 'car crash'. He is bullied by them and his fat, spoilt cousin Dudley, and lives a very unremarkable life with only the odd hiccup (like his hair growing back overnight!) to cause him much to think about. That is until an owl turns up with a letter addressed to Harry and all hell breaks loose! He is literally rescued by a world where nothing is as it seems and magic lessons are the order of the day. Read and find out how Harry discovers his true heritage at Hogwarts School of Wizardry and Witchcraft, the reason behind his parents mysterious death, who is out to kill him, and how he uncovers the most amazing secret of all time, the fabled Philosopher's Stone! All this and muggles too. Now, what are they? This is Jo's first book and she has already written seven outlines for Harry's further adventures at Hogwarts. U.S.A.: Bloomsbury Publishing PLC, 2015 First thus with new illustrations on paste-downs and end papers. A fine first printing in a fine slipcase of the new, first Gift Edition from Bloomsbury. Complete row of numbers from 10 to 1 on the copyright page. From Bloomsbury webpage -- "This gift edition hardback, presented in a beautiful foiled cloth slipcase decorated with brand new line art by Jonny Duddle, is the perfect introduction to Harry Potter.". Special Edition. Hardcover. Fine/No Jacket. This is not the illustrated edition. 2001-08-04. New. Ships with Tracking Number! INTERNATIONAL WORLDWIDE Shipping available. Buy with confidence, excellent customer service! 2000-03-05. New. Ships with Tracking Number! INTERNATIONAL WORLDWIDE Shipping available. Buy with confidence, excellent customer service! People's Literature Pub House. Paperback. 7020033431 Please allow 4 - 14 business days for Standard shipping, within the US. Thank you for supporting our small, family-owned business! . New. 2002-01-01. Chinese. People's Literature Pub House. Paperback. 7020033431 Please allow 4 - 14 business days for Standard shipping, within the US. Thank you for supporting our small, family-owned business! . Fine. 2002-01-01. Chinese. Moscow: Rosmen Press, 2001. Book. Fine. Hardcover. 1st Edition. This is a copy of the first Russian edition which is titled [Garry Potter and the Philosopher's Stone] There is no 'H' in the Russian alphabet and the letter 'G' is sometimes substituted as was done with this title. The pages are very mildly toned and a neat previous owners name is present otherwise it is in as new condition. The Pictorial boards are without dust jacket as none was issued from the publisher and they are illustrated by Mary GrandPre. The verso of the title page also indicates copyright Joanne Rowling. Uncommon edition of this title..
European Schoolbooks. Hardcover. 5845107415 New Condition. . New. European Schoolbooks. Hardcover. 5845107415 Like New Condition. . Fine. Bloomsbury. Hardcover. 1408871874 Brand New ,Original Book , Direct from Source , Express 5-8 Business days worldwide Delivery. . New.